Moral imperatives usually trump economic arguments. The charitable impulse to help the needy arises from a moral imperative. Those two facts help explain why it's extremely difficult to fix, scale back or replace government social programs even when they are indisputably inefficient, unaffordable or even downright harmful to those they are intended to help. This endlessly frustrates fiscal conservatives who want to solve these budget-busting problems. But, unlike their social-conservative brethren, fiscal conservatives are more accustomed to making economic arguments than moral arguments. Instead, we should be making the moral case for downsizing the welfare state and letting civil society have some room to breathe. Welfare is not just a fiscal issue. It is a decidedly moral one as well. Fiscal and social conservatives alike generally agree on three broad goals for programs intended to help people beset by poverty, addiction, homelessness and other special hardships. Those goals are to improve the programs' success rates, reduce their cost and make their recipients less dependent on government. Let's look at the moral case for such reforms. To get some perspective, we first have to look at the history of aid in America. The contemporary term "social services" helps tell the story, because the term was not used in the Colonial and Founding eras. In those days, the closest analogue would have been "charity." Virtually all charity was funded and administered privately, apart from government. It was typical for charities to operate with explicit religious motivations and goals. Religious and nonreligious charities tended to extend aid coupled with close monitoring, accountability and relationships between recipients and givers. Providing charity was a virtuous act that could be individual or corporate. Helping the needy per se was not considered a public service of government, but rather the job of voluntary institutions in what we would now call "civil society." Two things occurred in the evolution from "charity" to "social services." First, the nature of some charities changed in response to ideological and societal trends in the second half of the 1800s. Charities arose that dispensed aid while de-emphasizing spiritual matters and religious motivations. Many made few demands of recipients or required little follow-up with them. Recipients naturally gravitated to charities that offered the most aid with the least strings attached. This paved the way for the second change. Government's involvement in aid programs was legitimized, in part, by the trend to separate material aid from spiritual aid and accountability. Government had to remain officially nonsectarian. Government grew to assume more and more of what had once been the near-exclusive province of churches, families and religious and nonreligious aid societies. Aid became part of the public policy and political agendas, and eventually became divorced from the private moral and religious contexts that had nurtured it. But this didn't happen immediately. By 1919, the term "social service" had begun to take hold as a nonreligious umbrella term covering different kinds of private charity as well as government's growing role. Still, the term didn't so much redefine "charity" as re-contextualize it. Charity was still private, but it was now merely one way to help needy people. Government added "social services" to its growing list of functions. This didn't necessarily expand society's capacity for charitable work, however, since private charities began to understand their role, at least in part, by what the government was not doing. Government social programs multiplied, and spending grew dramatically with great popular and political support, particularly in the 1930s and 1960s. The new aid philosophy, dominated by government, tended to crowd out charities that connected aid to spiritual matters, accountability and personal relationships. But persistent poverty and a growing underclass invited skepticism. In his 1984 book "Losing Ground," Charles Murray persuasively demonstrated the perverse incentives of government welfare programs. They hurt many people who needed help the most. Marvin Olasky, in 1992, chronicled two centuries of poverty-fighting in his book "The Tragedy of American Compassion." He concluded that government programs could not match the success of private programs that employ spiritual and relational components. In 1995, Robert Rector and William Lauber estimated the cumulative cost of the three-decade "War on Poverty" at $5.4 trillion, which was more than the U.S. spent fighting World War II. In 1996, Congress and President Bill Clinton seemed to respond to Murray's (and others') findings by placing work requirements and time limits on welfare recipients. This victory was a step in the right direction, but only a step. The positive shift in welfare policy showed the power of moral arguments. We can further harness moral arguments to shift welfare policy even closer to the ideal where private charity, greatly expanded, reduces poverty so much that little justification remains for government social programs. It's a tall order, but not an unknown ideal. As Olasky documented, it's an ideal to which we were once much closer. To move toward it, conservatives must consider moral arguments anew. This means fiscal conservatives, especially, must embrace the legitimacy of moral arguments and use them. Moral arguments, not merely economic ones, have produced the major changes in social service policies. The moral argument for welfare reform does not focus so much on how much is spent, how much is saved or how efficient a policy is. Rather, it seeks to answer this question: What policy will, in the long run, best help those in need? When people believed more money was the key to helping people more, the policy they supported was to involve government and its vast funding apparatus. Decades later, when Murray and others showed that the resulting programs were harming those they were supposed to help, the programs were modified by adding some of what Murray said was missing. Economic arguments were made for all these changes, but those only augmented the moral imperative of how best to help needy people. The lesson is that moral arguments ultimately matter more than economic ones, at least in public policy debates. Durable policy changes don't appear out of nowhere. Most of the time, they arise from political changes that, in turn, flow from social movements. Social movements in America have been driven mainly by moral ideas framed in terms of how to help people, not merely by cold logic, hard economic data and the bottom line. It was principally moral convictions and arguments that drove the social movements behind abolition, civil rights, women's suffrage, prohibition, labor unions and environmental activism. These social movements all produced major changes in public policy. The contemporary political Left may be more successful at framing its policy goals in terms of how to help people, but the political Right has its own successes to build on. School choice probably would not have progressed in the last two decades without compelling moral arguments for permitting parents to choose the safest and best schools for their children. Economic analyses were necessary, but they would not have been sufficient. 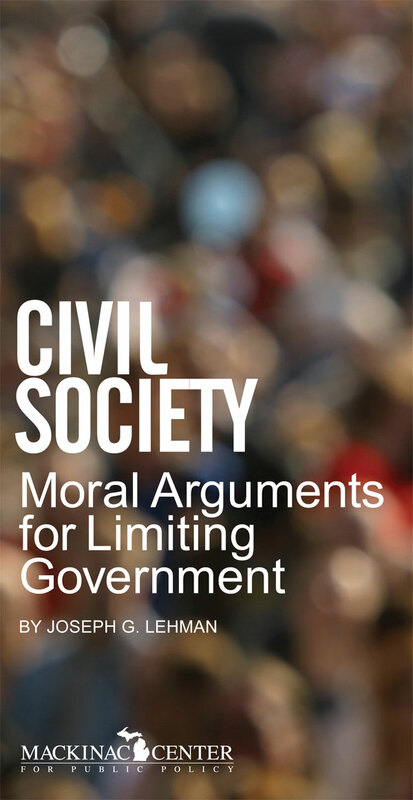 Another moral issue concerns the nature of government itself and the morality of using government to accomplish certain ends, such as reducing poverty. The sanctioned use of force is what distinguishes government from all other institutions. For some functions, force, whether direct or indirect, may be necessary - even morally imperative. But the issue is complicated in liberal democracies, where the use of force is rarely overt. As a result, it's easy to opt for the coercive power of the state without quite realizing it. Whether or not we intend it, however, every tax, expenditure, regulation, police action and mandate is ultimately backed by the legal use of force. When people do not comply, they are either forced to comply or met with the threat of force. And the use of force always has moral implications. Different societies extend aid to needy people in different ways. The driving force behind aid in a society can locate that society on a spectrum that runs between two poles: compulsion and voluntarism. Near the compulsion pole lie societies in which the state compels citizens to help others through taxes and other means. Near the voluntary pole lie societies characterized by citizens who help one another without being forced. Societies near the compulsion pole require expansive governments powerful enough to force people to do what they might otherwise not do. 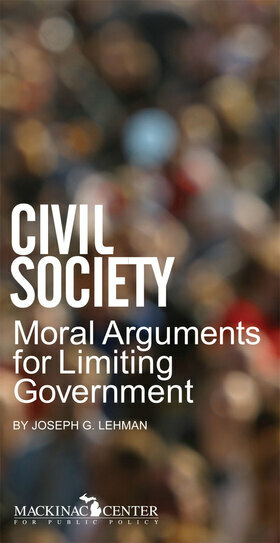 Societies near the voluntary pole have more limited governments. Put another way, in some societies, the government constrains its people. In others, the people constrain their government. All governments employ force, but at one end of the spectrum, the force primarily restrains people from unjustly harming others. At the other end, the force routinely compels people to do what might be virtuous if it were voluntary. Somewhere along the spectrum, a government ceases to be limited. The distinction is not merely academic. It has practical consequences. As we've seen in the case of welfare, for instance, when certain forms of "help" are taken over by government, they become less helpful. They can even become harmful. The problem is rooted in using the state to deliver charity in the first place. Charity is an exercise of private virtue. And virtue requires freedom. Therefore, it's impossible to force someone to be charitable. If something can be accomplished voluntarily rather than coercively, surely we ought to prefer voluntarism. And with regard to "social services," we have every reason to argue that these can not only be performed, but be performed better, by voluntary charities. The moral burden of proof should lie squarely on those who seek to replace voluntarism with redistributive coercion. Of course, moral arguments are grounded in some moral vision, some notion of ultimate truth, but not everyone agrees on the source of ultimate truth. Some do not believe in God and others conceive of God differently. One brief essay is not the place to settle ultimate questions, but perhaps we can affirm principles upon which all can stand. Social movements draw their power from moral conviction. Fiscal conservatives must not leave it to social conservatives alone to advance moral arguments. Those who sought abolition and civil rights for political or economic reasons were successful because they worked in league with those who advocated those goals on moral and often explicitly religious grounds. Effecting durable change in public policy by means of economic analysis alone is like bringing a knife to a gun fight. Uniting with a new focus on moral suasion and a better articulation of the moral implications of government force is what will win the day. Will Real Reform Please Stand Up? [*]"Indivisible" is a collection of essays showing the interdependence of economic and moral principles in advancing liberty and human dignity. A complimentary copy can be ordered at Culture4Freedom.org. 1 Alexis de Tocqueville was one of the most insightful observers of this phenomenon. See de Tocqueville, Democracy in America, trans. Henry Reeve (Cambridge, Mass. : Welch, Bigelow, and Company, 1835), pp. 129-130. Marvin Olasky contributed enormously to contemporary understanding of historical changes in American charity in his book The Tragedy of American Compassion (Washington, D.C.: Regnery Gateway Publishing, 1992). Olasky's The Tragedy of American Compassion resurrected the provocative term "promiscuous charity" to describe this kind of assistance. The term had been used as early as 1849. See James Hill Burton, Political and Social Economy (Edinburgh: W. and R. Chambers, 1849), p. 326. W.N. Hutchins, "The Psychological Approach to Social Service," Religious Education: The Journal of the Religious Education Association Vol. 14, Issue 6 (1919), pp. 365-368. Charles Murray, Losing Ground, 2nd edition (New York: Basic Books, 1984). Olasky, The Tragedy of American Compassion. Robert Rector and William F. Lauber, America's Failed $5.4 Trillion War on Poverty (Washington, D.C.: The Heritage Foundation, 1995). New calculations in the fall of 2009 by Robert Rector put the total at $15.9 trillion on means-tested welfare since the beginning of the War on Poverty (in inflation-adjusted 2008 dollars). See "Obama to Spend $10.3 Trillion on Welfare: Uncovering the Full Cost of Means-Tested Welfare or Aid to the Poor," The Heritage Foundation, September 2009. See U.S. Department of Health and Human Services, HHS Fact Sheet, "The Personal Responsibility and Work Opportunity Reconciliation Act of 1996," at http://www.acf.hhs.gov/programs/cse/new/prwora.htm (accessed August 13, 2009).